*WARNING: Children should be taught to never hug a dog they are not familiar with. Dogs who don’t know you, may see a hug as a threat. 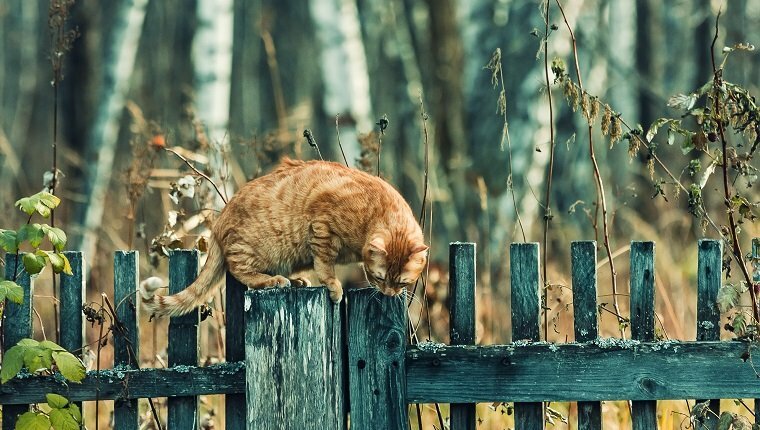 It is the cause of many dog bites every year. So with that said, let’s talk about how to train your dog to give hugs. You’ve probably seen adorable YouTube videos of dogs who happily give cuddly hugs on cue and thought that you’d like to teach your dog to do it so you could impress your friends with this cute trick. Here are a few pups that already have the hang of it and love giving cuddly hugs! There are a few things to consider before you start teaching your dog to hug on command, including whether or not your pup will be capable of performing the task. If this trick is right for your pooch, it will take some time and effort like any other command. 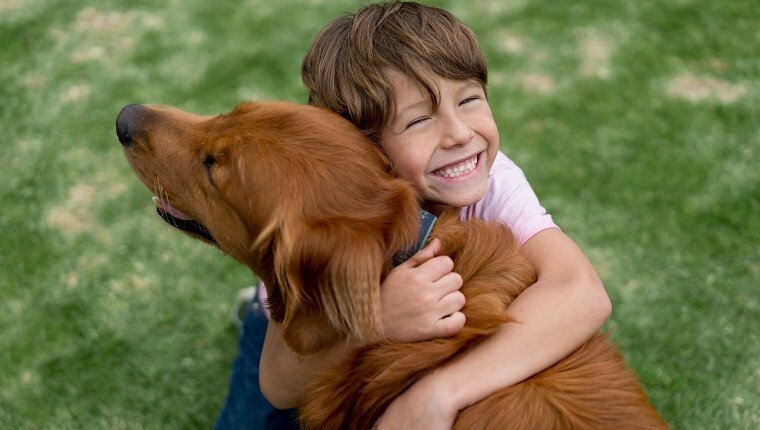 Here’s how you can teach your dog to give hugs and what you should consider before you begin. There are a several factors to take into account before training, including your dog’s breed, physical health, and comfort level. 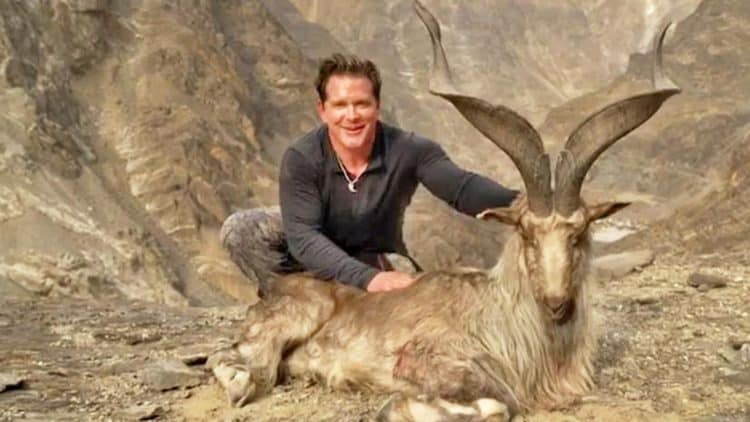 Certain breeds won’t be capable of giving a full, arms-on-shoulders hug because their backs aren’t suited to be in that position. 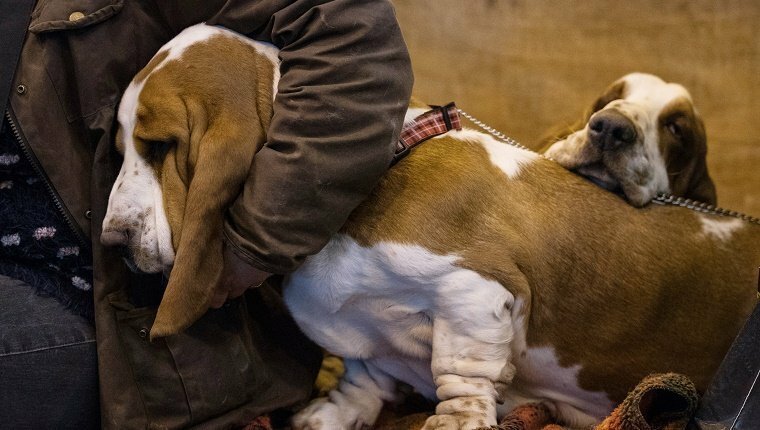 Basset Hounds, Bulldogs, and certain giant breeds don’t have the skeletal structure that will allow them to perform this trick safely and comfortably. If you are concerned, ask your vet if this command is right for your dog. You should also make sure your dog is in good enough physical health. Dogs with hip dysplasia, arthritis, or other medical conditions that affect the back, hips, bones, muscles, or joints should not give hugs. Doing so could cause pain or injury, and it’s not worth risking your dog’s health. Some dogs are extremely uncomfortable with being embraced. 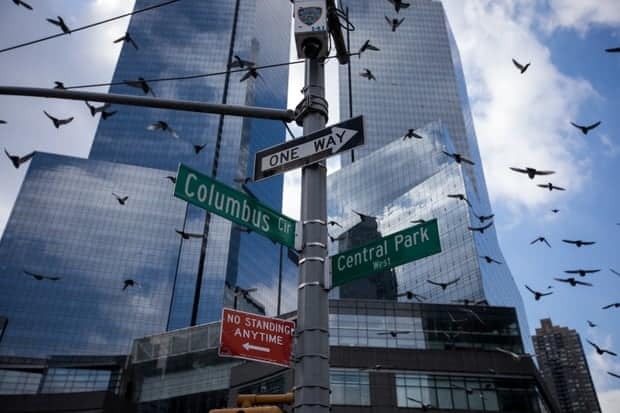 They may see it as a threat, or it could make them feel confined or restricted from moving. 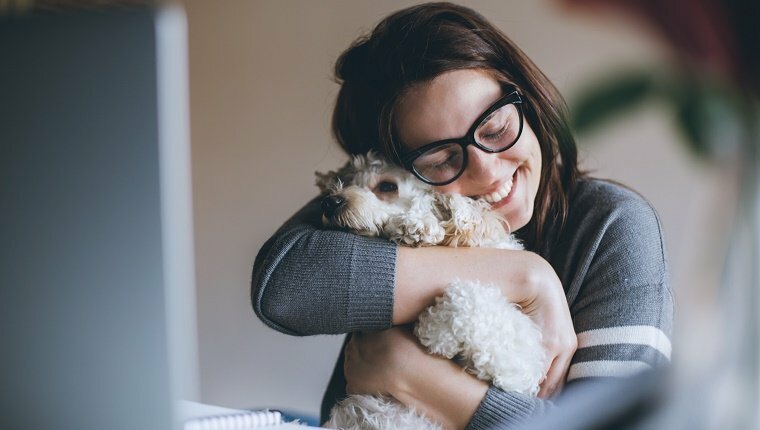 Teaching a dog that a hug is a trained action that results in a reward can reduce the anxiety they feel when being hugged, but consider your dog’s comfort level and don’t force it. Working at this trick gradually can help, but some dogs simply do not want to be hugged and shouldn’t have to if they don’t want to. This is a moderate skill level command, and your dog should know at least how to sit, stay, and give a paw, as well as be able to keep focus on you while learning a new trick. Hugging is not a natural thing for a dog to do, so it requires a bit more skill on your part as the trainer. If you are confident in your dog’s abilities and the strength of your bond, try this more advanced command. If not, get back to the basics until you have them down. 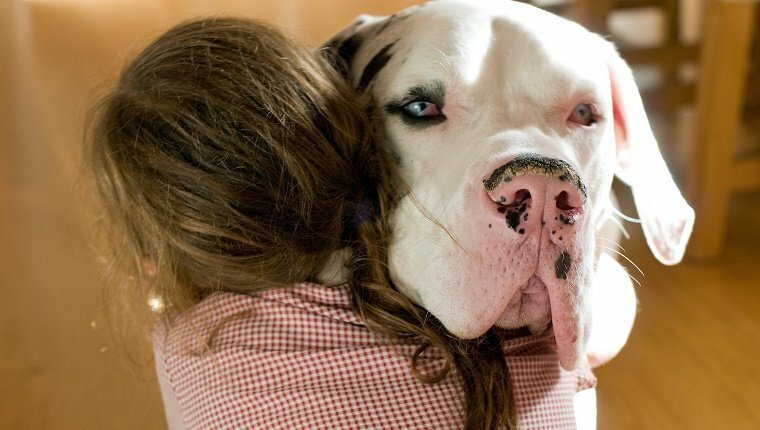 There are a few different types of hugs you can train your dog to give you on command. You can teach your dog all of them with a different verbal cue or hand signal for each, or you can pick your favorite. The head-on-shoulder hug just requires your dog to tuck their head onto your shoulder and wrap around your neck a bit. You can even have your dog put a paw up on the opposite shoulder for a one-arm embrace. 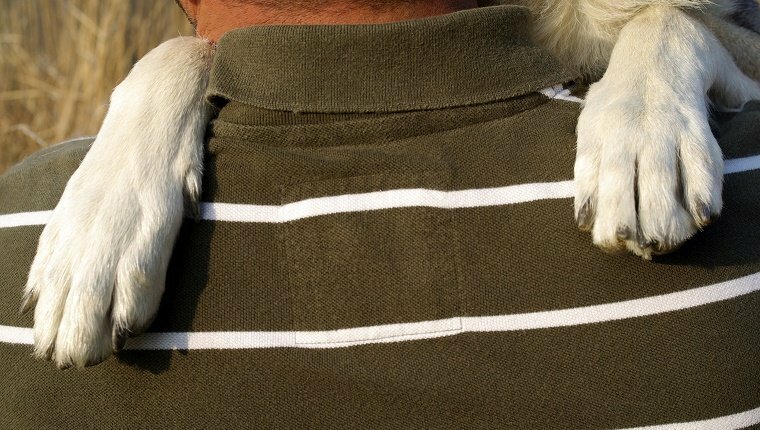 The arms-on-shoulders hug requires your dog to put a paw on each of your shoulders before drawing you in for a hug. This requires your dog to be comfortable with sitting back on their hind paws for balance while embracing you, so it’s a more advanced command. 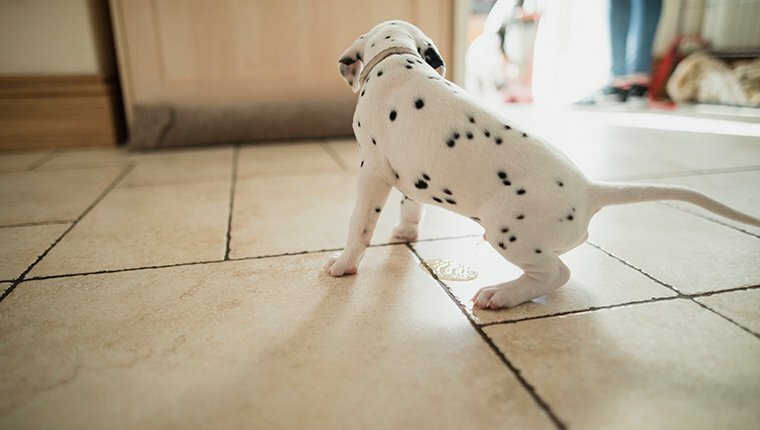 Keep in mind that both of these tricks require you to get down to your dog’s eye level, so it can be tougher for small dogs, though allowing your dog to sit up higher on a piece of furniture while you take a knee on the floor can work for tiny pups. The head-on-shoulder hug is the more simple of the two types of hugs covered here. It involves your dog placing his head on your shoulder and neck, and that’s about it. 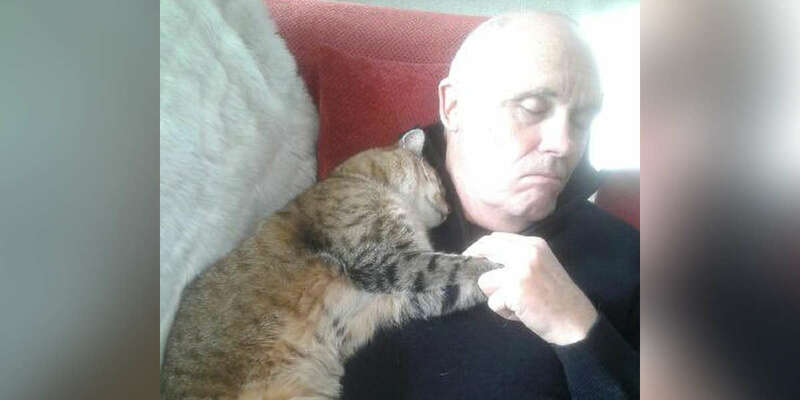 You can also add placing a paw on your other shoulder if you wish. Here are the steps you should take. (Optional) If you want your dog to put a paw on your other shoulder while doing this, start by training your dog to place their front paw on your shoulder. Place the paw on your shoulder yourself, then reward your dog by giving them a treat from behind your head over the opposite shoulder. Once your dog understands that this is the expected behavior, continue with the next steps. Place a treat in one hand and hold it behind your head over your shoulder. Have your dog approach the treat from in front of you and reach for it. 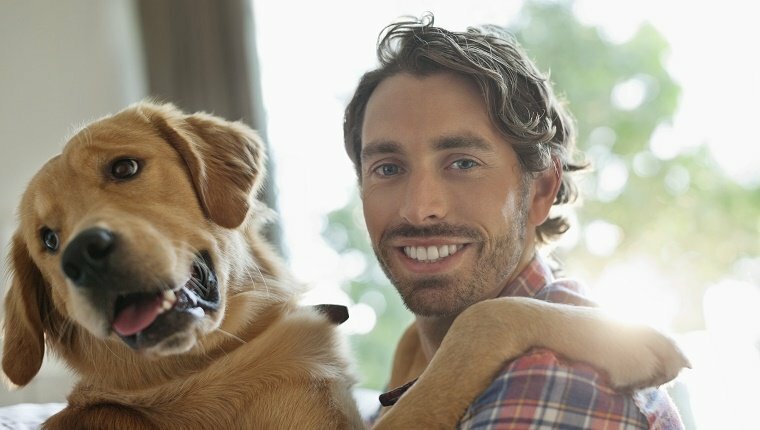 Your dog should be leaning over your shoulder. If they go around your back for the treat, start over and be patient. Try this a few times without a command giving plenty of rewarding praise for a job well done. If your dog gets distracted, take a break for a while. Start incorporating a command like “hug” or “love” with the action. Repeat the process. Once your dog understands what is expected, slowly increase the amount of time your pup spends with their head over your shoulder before giving the reward. 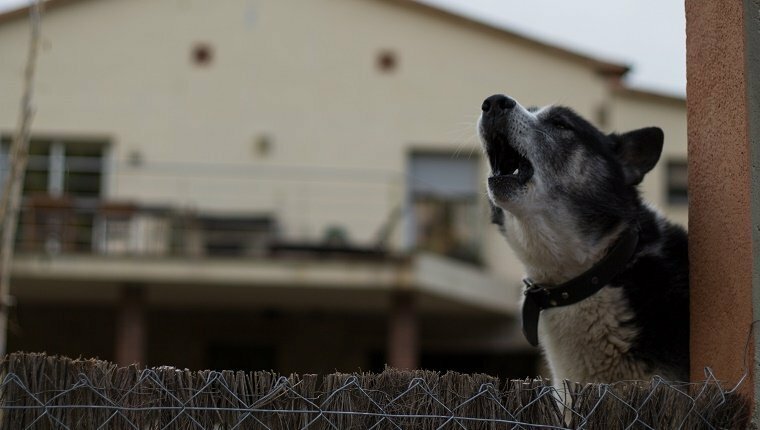 When your dog can perform the behavior consistently, try giving the verbal command without holding your hand behind your head. If your dog is still having trouble, continue to hold your hand behind your head, but start reducing the amount of time you’re doing it until your dog can just respond on the verbal command. For some dogs, jumping up with both paws to greet people is a behavior that comes naturally. 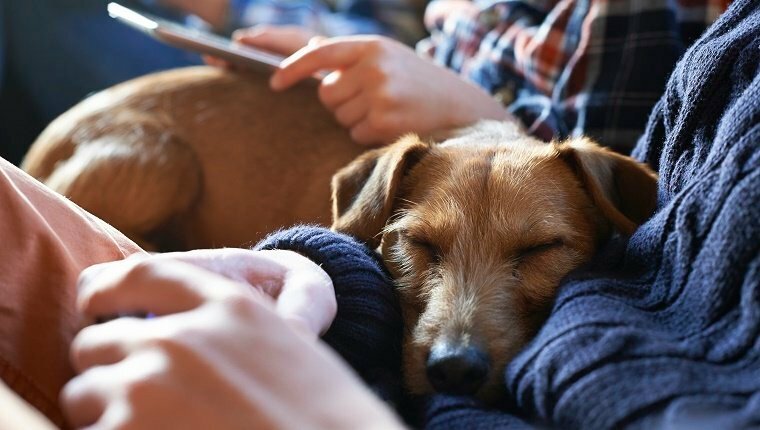 Though it is not encouraged for you to allow your dog to learn that jumping up is acceptable, retraining it into a hug that is to be performed only on command can actually help curb the behavior. If your dog jumps up with both paws naturally, start incorporating a verbal command like “hug” or “love” each time they do it and reward the behavior. When your dog starts to associate the command with their behavior, you should only reward if your pup performs the action after the command. 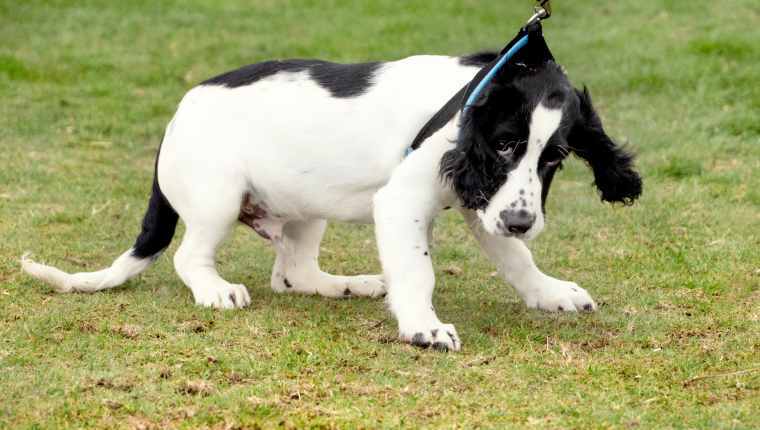 If your dog is still jumping up before the command, ignore their actions and do not reward. If they are doing it on command, give treats and lots of praise. If your dog doesn’t naturally jump up, you’ll need to put their front paws on you and follow up with a reward. 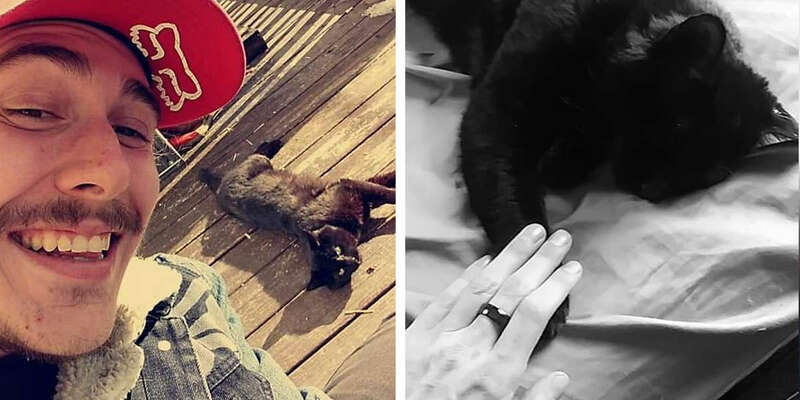 Gradually increase the amount of time that they have their paws on you before rewarding. 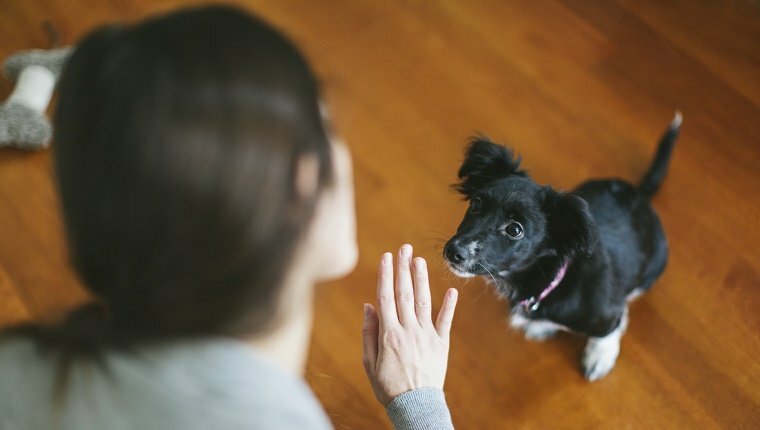 Start incorporating the verbal command until your dog can put their paws up on you without your assistance. Make sure your dog can obey the command consistently. Once your dog can jump up and put their paws on you on command and only on command, get down on your dog’s level by kneeling in front of them. Make sure they are in the sitting position so they can balance on their hind legs. Use your hug command in this position. Make sure your dog’s paws go up on your shoulders. 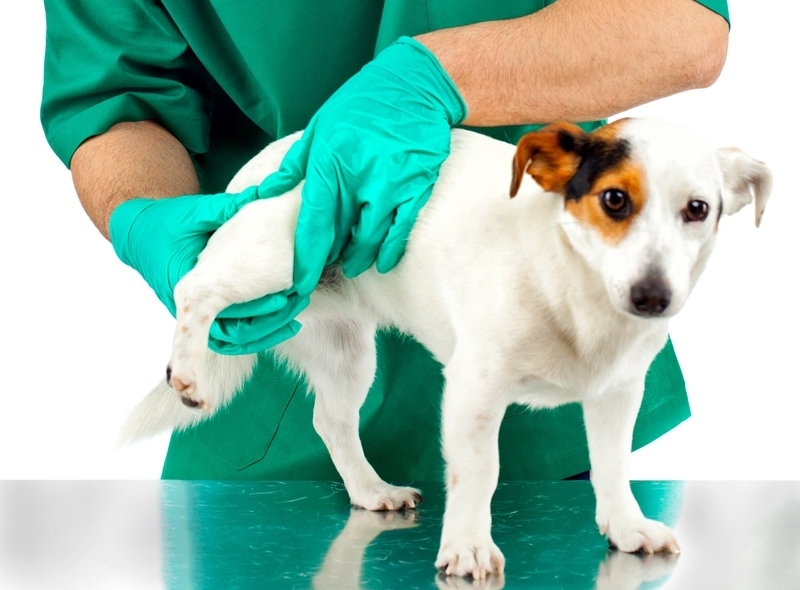 If your pup is having trouble, you may need to place their paws on your shoulders yourself. Give rewards. When your dog understands the desired behavior, only reward when your pup gets it right. Gradually increase the amount of time between your dog putting paws on your shoulders and giving a reward. Your dog should stay in the hug position until you release them and give them praise and treats. Have you trained your dog to give hugs? 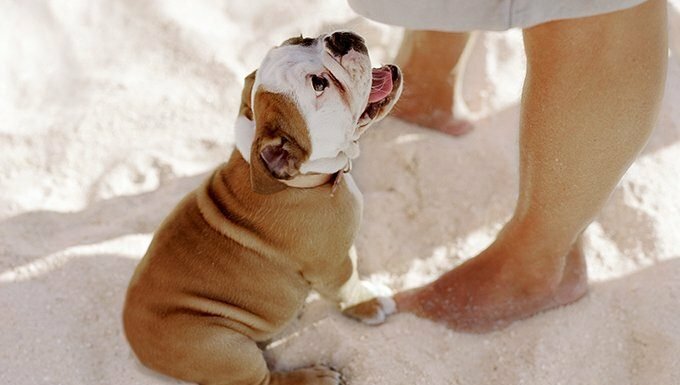 What are some tips you can share to dog owners teaching their pups for the first time? Let us know in the comments below!